Google got more than a few raised eyebrows when a possible candidate for the next Nexus phone, bearing what was probably LG branding and a Nexus 7 2013-style horizontal logo, was leaked in the video for the Android 4.4 statue. 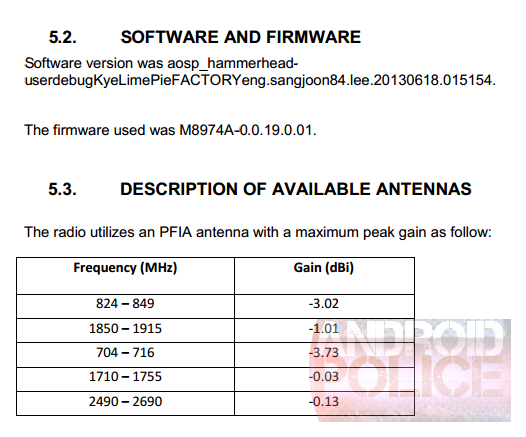 Now some sleuths at S4GRU have connected a few dots and found that an FCC filing for the LG D820 looks an awful lot like that leaked device. The FCC filing is focused on the phone's wireless specifications, since that's what the Commission has to certify. 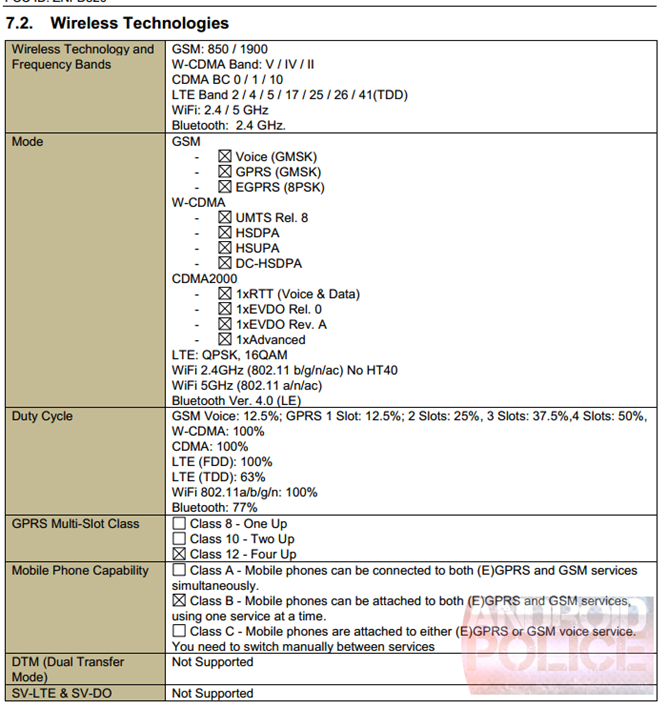 Wireless bands include a GSM/CDMA/LTE radio array that could work on AT&T, T-Mobile, and Sprint, with only Verizon unsupported among the Big Four. Assuming that this is the real deal, that could be an active decision from Verizon (as everyone is still a bit sour from the sub-par treatment of the Verizon Galaxy Nexus), or a hardware limitation based on Verizon's LTE 750 spectrum. Note the camera and flash holes on the rear housing - they match up with the leaked photos. Update #2: This device may indeed support Verizon once it rolls out Band 4 LTE (1700Mhz) later this year. The 126mm display size referenced below works out to a 5-inch screen (well, 4.96 inches). Beyond that, there's no way to know display technology or resolution, but 1080p would match the LG G2. Other specifications from the filing include wireless charging, 802.11ac Wi-Fi bands, case dimensions (131.9x68.2mm, no Z depth yet), and a battery rating: 2,300mAh. 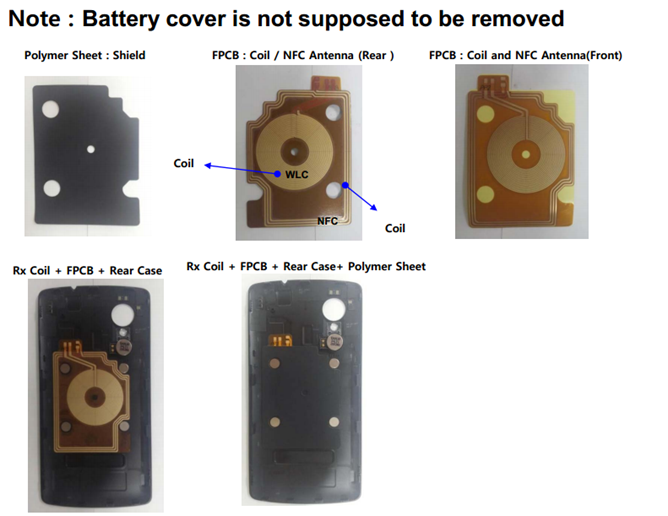 Like the Nexus 4, it will not be removable. Just for reference, the model number for the LG G2 is D800 and D801 for different variants. While the D820 seems to be related to it in many ways, the dimensions, screen size, and battery capacity (3,000mAh) don't quite match up to the G2. With Google announcing Android KitKat and the Nexus smartphone due for a yearly update, it certainly looks like this might be the right device. 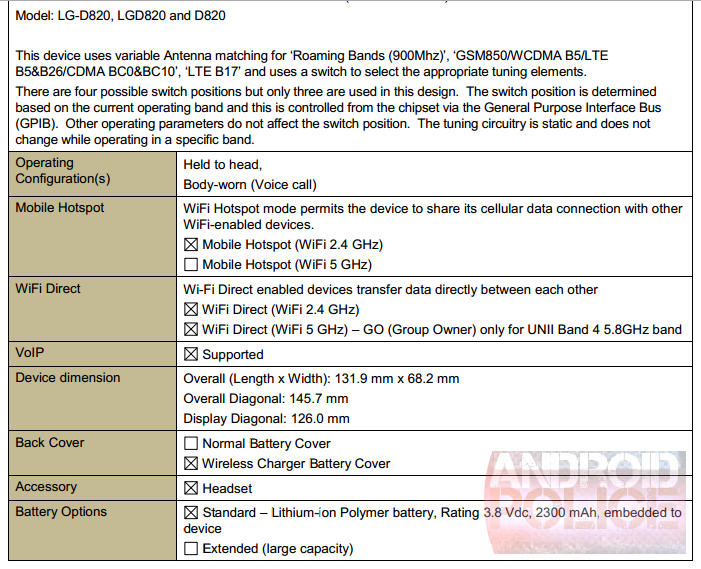 Update #3: Here's something interesting to look at regarding the LG D820.